PEUGEOT’s supermini flagship – the PEUGEOT 208 GTi by PEUGEOT SPORT - has raced to success in this year’s Evo Car of the Year Awards, taking the best supermini accolade. The PEUGEOT 208 GTi by PEUGEOT SPORT instantly struck a chord with Evo’s road testers when first launched, praised for its potent combination of driving dynamics, performance and everyday usability. As a result, it has been crowned top of the performance supermini class. 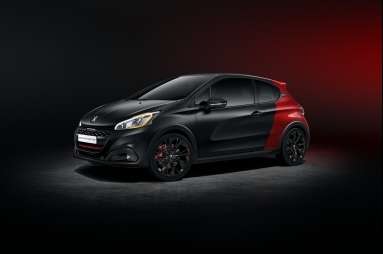 Instantly recognisable thanks to its striking Coupe Franche colour scheme, 18” ‘Lithium’ multi-spoke black alloy wheels and PEUGEOT SPORT badging, the PEUGEOT 208 GTi by PEUGEOT SPORT is equally performance-led on the inside. Passengers are treated to a bespoke alcantara interior with contrast red stitching, and the PEUGEOT i-Cockpit® provides an intuitive driving experience in combination with the responsive compact leather steering wheel. The exhilarating performance of this car is demonstrated with an acceleration from 0 to 62 mph in 6.5 seconds (covering 0 to 1000 m in 26.5 seconds). This is matched by an equally impressive braking system: the brake discs are 323 mm in diameter and 28 mm thick and come fitted with Brembo fixed four-piston calipers - a PEUGEOT SPORT signature feature - all with a view to ensuring optimum braking stability. The PEUGEOT 208 GTi by PEUGEOT SPORT will be featured in Evo’s Car of the Year edition, on sale on December 23rd 2017. The Evo Car of the Year Awards is described as the biggest and most important story in Evo’s year, naming the best performance cars on sale today. Evo Car of the Year winners major on driving dynamics, but offer all-round appeal for motorists looking for a genuinely exciting driving experience. David Peel, Managing Director at PEUGEOT UK, commented: “Given the loyal following the 208 supermini has in standard form, it is little surprise that the GTi by PEUGEOT SPORT form makes a very beguiling option – something that has been recognised by the team at Evo. The PEUGEOT 208 GTi by PEUGEOT SPORT range starts at £23,550* RRP and can be configured and ordered online using PEUGEOT Order Online. The UK is the third largest market for PEUGEOT with its UK Headquarters located in Coventry. The UK car line-up includes the 108, 208, 308, 508, 2008 SUV, 3008 SUV and 5008 SUV supplemented by people-carriers and a four-model van range that includes the Bipper, Partner, Expert and Boxer. The standard car and van line-up is supported by Electric Vehicles. The range includes the iOn and the Electric version of their most popular small van, the Partner Electric.